Egypt’s Islam El Shehaby refused to shake hands with Israel’s Or Sasson after their judo match at the Rio Olympics on Friday, drawing boos from the crowd and stirring a debate about intolerance at the Games. The International Olympic Committee (IOC) opened a disciplinary commission after El Shehaby, who lost the first round elimination bout, backed away when Sasson bowed and approached him to shake hands. El Shehaby and Sasson did not comment after the match inside the Carioca Arena 2. An IOC official said the organisation’s president, Thomas Bach, ordered the disciplinary commission as soon as he heard about the incident. “We believe that the Olympic spirit should be about building bridges, never about erecting walls,” IOC spokesman Mark Adams told a news conference. He said that the general spirit of toleration at the Games was exemplified by the athletes’ village, where competitors spend time socializing after competing. Sasson, speaking to reporters after winning bronze in the +100kg category, shrugged off the incident. “For me it doesn’t matter because I’m a professional, I only think about fighting. I knew there was a chance he would not shake my hand,” said Sasson, who was fighting El Shehaby for the first time. “I cannot say anything, this was his decision,” he said. El Shehaby did not comment after their match. Nicolas Messner, a spokesman for the International Judo Federation, said judokas are not obligated to shake hands under IJF rules, only to bow, which El Shehaby did after he was called back. “Nevertheless, after the Games the situation will be studied and analyzed to see if further action must be taken,” he told Reuters. Some Israeli and Lebanese athletes had an argument last week about sharing a bus to the opening ceremony of the Rio Olympics. The Lebanese team admitted preventing Israeli athletes from boarding but said it was because the bus was reserved for members of its team. The Egyptian Olympic Committee said in a short statement on its Facebook page: “We told Islam El-Shehaby before the game he should fulfill all the sporting behaviors and rules against his Israeli opponent as this is just a game in a big world tournament. What happened after the match was just personal behaviour”. Sasson’s brother told Israel’s Channel 10 that Sasson was focused professionally and tactically on the competition. The incident with the Egyptian did not appear to involve any personal animosity, he added. “This is something driven perhaps by the Egyptian people, by the Egyptian regime, but it does not look to me like something personal,” he said. 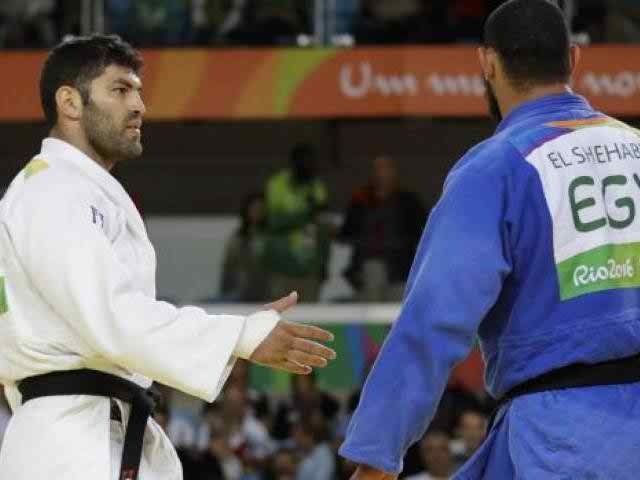 0 Response to "Egyptian judoka refuses to shake hands with Israeli rival"